It is with great sadness that IAMCR informs its members of the passing of Professor Dipak De following a bout with cancer. Dipak was a longtime member and supporter of the association, having served as a member of the International Council and of the Finance Committee, where he arranged the association's annual audit over a span of several years. In 2015 Dipak was awarded the association's distinguished contribution award. Dipak's son, Debraj De wrote this letter to the members of IAMCR and GCRA (Global Communication Research Association), two organisations "very close to his heart". Also below are letters received from Hopeton Dunn, former General Secretary of IAMCR, and Aditya, one of Dipak's former students. I am Debraj, Prof. Dipak De’s son. I have been introduced to you all, through my dad’s sharing of his experiences. Today I would like to share with you a bit about the impact IAMCR and GCRA has on my dad’s life and in turn on myself. You have been his extended family and he used to talk so often about the conferences, interactions with other delegates and the friends he made with a lot of enthusiasm.It made him very happy and he had very fond memories. My dad hails from a small village which is still not registered in google maps. It is located near the rail lines which run towards an Indian Metropolis, Kolkata. As a child, he always used to think that he should study well so that he could purchase his own train ticket to Kolkata. At a very early age, he comprehended the importance of education, finance management and actively persuing one’s passion. In the mid 1990’s he got his very first opportunity to travel outside India through one of the conferences. I was around 11 years old then and my sister was 6. My dad was thrilled and so were we. He came back with lot of memories, new friends and gifts for the entire family, friends and colleagues. He spoke to us about it for days. He would look forward to the upcoming conferences. He would involve me and my sister as well and speak to us about his papers that he was going to present. Around 2000, the conference was held in Canada (GCRA conference I believe) and the theme was News. He asked for my views on news. I wrote some lines and made it into a poem. He called on the day after presenting the paper to say that he started his presentation with the poem. I also had the opportunity to meet a few of you, when the GCRA conference took place in our hometown Varanasi in 2002/03. I could see how the events are conducted and the joy it brought to dad. He felt truly honored with the IAMCR facilitation in Montreal 2015 and said that it was a red-letter day in his life. The events also helped him to explore many places and culture across the world, which he was extremely passionate about. I got vivid descriptions of the pyramids of Egypt, colors of Istanbul, the Nobel laureate hall in Stockholm, the cruise with the midnight sun, the jungle safari from Durban and the Irish Haggis. He was eagerly looking forward to go to Colombia last year. But in April, he suddenly fell one day and could not walk after that. The tests showed for the first time that he was in the last stage of cancer which had spread throughout. Since then, his health went through various ups and downs but he always remained in very high spirits, joking, laughing, being his jolly self and sharing his IAMCR and GCRA memories. As this email reaches you, he is very close (few hours to few days) to becoming a free spirit once again. Both GCRA and IAMCR were organizations very close to his heart. I would like to convey my heartfelt thanks for all the opportunities the organizations gave to dad, that enriched him in so many ways and which in turn helped me to grow as a person. Hopeton Dunn, former General Secretary of IAMCR, wrote the following. I am very saddened to hear of the passing of Dipak Di. He was a good friend of mine and we spent much time chatting and sharing information during every conference that we attended together over several years. Dipak was an extraordinarily devoted member of IAMCR who offered unstinting support to the leadership of the Association, something I came to appreciate even more during the years that I served as Secretary General. As was noted, Dipak was the auditor of our accounts for over a decade and served in many other key roles. He was a research active scholar especially on issues of rural and agricultural communication, with many books and conference papers to his credit. 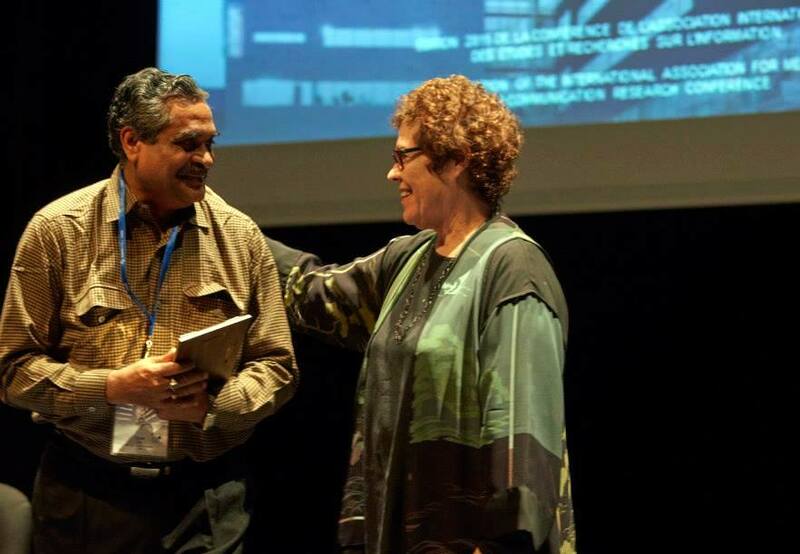 Professor Dipak Di was thrilled to be given an IAMCR Distinguished Contribution Award at Montreal in 2015. We sat together in the conference hall at the closing plenary when he went up proudly to receive the award from Janet our President. I grabbed a few hurried photos of the moment on stage and a few more shots of him afterwards as he quietly reflected on the honour. He was indeed thrilled. My deepest sympathy goes out to his entire family, including his son Debraj, who shared such a poignant reflection on his dad on our website. I also send my condolences to his profesional colleagues in India, especially those from Kolkata and from the Banaras Hindu University in Uttar Predesh. A tribute to my beloved, Dipak De Sir! Dr. Dipak De, he was called. This person was more than God to me. Not only he was an excellent teacher of entrepreneurship and research methodology but also a true guide and friend at all times. I still remember how I attended all his classes but rarely took notes because it was so easy to imbibe his teachings. I remember how he helped me personally with my thesis and with career options at every point of conflict. A student always faces such conflicts during his Master’s degree but few are fortunate enough to be guided by none other than De Sir. Above all, he was a great savior to me. I remember when he was the invited guest in the research council meeting to judge our research projects in Extension Education at Bihar Agricultural University, Sabour. While the then Vice Chancellor left no stone unturned in criticizing all the presentations, De Sir defended me with all his might. He said about my merits so many times from the stage that even the Vice Chancellor and other criticizers felt humiliated. I never know that if I will ever be able to take such strong stand with my student or not? I will have to say that this teacher of mine had so strong belief in me that even I do not have on me. He told me again and again when I was selected in State Bank as Probationary Officer that jobs will again come. “Once you are competent enough to crack State Bank exams, you can definitely get other bank exams later; complete your Master’s first.” A very good friend of mine, Tikaram Neupane from Nepal was his student. I never experienced such a change in a student after becoming his student. He was though a mediocre student but after guidance of De Sir, he was able to defend his thesis with flying colors along with a good rank in the class. After my recruitment as Assistant Professor at Bihar Agricultural University (BAU), Sabour; I met De Sir in Udaipur in December 2015 while attending a winter school. He was our guest faculty to lecture on entrepreneurship. Though he knew other participants too from Banaras Hindu University (BHU) who were attending the seminar, he interacted with me alone in his room for hours regarding my future plans, marriage and life in Sabour. He shared with me that he started his career from Udaipur as Assistant Professor in Maharana Pratap University of Agriculture and Technology (MPUAT). I was surprised to see that even after years; the workers at the guest house were very familiar to him. He asked me to be with him during his presentation and help him with the projector. He talked in detail about his students who are going a step further in their academic pursuits with his constant motivation and support. After that I met him personally in Varanasi in 2016 after my marriage when I was invited for a vice-voce examination by Dr. O.P Mishra Sir. De Sir was so happy that he was awarded with International Association for Media and Communications Research (IAMCR) award in Montreal, Canada for his academic achievements. He even asked me before to accompany him on the occasion but I could not do that due to other engagements in my University. After receiving the prize, he shared the pictures with me only then from Canada. I knew that this award is nothing for a personality like him. After this brief meeting, I got a call from him few months later when he asked me to write a review paper on innovations in the farming sector. Actually, he was invited to deliberate on innovations at Indian Science Congress 2017. After a month or so, I was trying to call him regarding the updates on the paper but the call could never be reached. One of my juniors from BHU informed me that, he is suffering from cancer and is admitted in Kolkata. It was really a great shock to me. I was just praying that what he said was wrong and he will get well very soon. I could never believe that a person so lively and enthusiastic can fall prey to cancer in no time. I always remember his words when in stress, “Believe in you at all times”. I always wished to see him in the hospital. Just two weeks before; I asked Jirli Sir the location of the hospital in which he is admitted. To my utter bad luck, I failed to see him. Only today I got to know, that he has left for the heavenly abode yesterday (21 January 2018) at 8 P.M.
Today is Sarawati Puja where we worship the Goddess Sarawati, the goddess of knowledge and wisdom. I dedicate this festival to my beloved De Sir who will always remain my source of knowledge and inspiration. His demise is not only a great loss to the extension fraternity; it is a great loss to all the students who looked upon him for hope, for joy and for passionate learning. I wish that I am again his student in the next life. No one can replace you forever. Rest in Peace Sir. Miss you so much.